After watching UCLA play its second game under Coach Nikki Caldwell, I’m not sure what to think. Last week the Bruins began strong and faded. Today they started well, lost momentum and let SRP catch up, and then in the second half, they exploded offensively. UCLA had 38 points in the first half, and scored almost double that in the second. They had far fewer rebounds than in their previous game, and today they shot 44 percent in the first half and 71 in the second. A little schizo? Naw – it was just the Caldwell Effect. 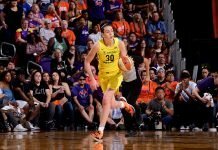 “I don’t think they’re going to want to practice with me tomorrow,” Caldwell said in the post-game interview, glancing over her shoulder at the closed locker room door. She added that the team “did a good job of taking the challenge” that she presented to them at half time. It seems to me that the new coach is trying to wake up a team lulled into inertia by years of bad coaching. She’s doing a good job of it, too. In the first half there were two instances in a row where the Bruins suddenly found themselves with the ball after a turnover, and the entire team hesitated. Both times, Caldwell shouted “GO!GO!GO!” at them. As if a fire alarm had gone off, they shifted into another gear and started fast breaking, like they should have been in the first place. In the second half, they kept up the defensive press almost the entire time. Though my seatmate isn’t as sure as I am, I think the team seems faster this year. I have no doubt that Caldwell is emphasizing strength and conditioning the way Tennessee does, and thank god for that. But I also think part of the reason the team seems faster is because they’re more aggressive. Good signs, one and all. In the first half, the rebounds weren’t clicking well and neither was the offense. UCLA looked a bit out of sorts, and shots weren’t falling. Caldwell talked to players individually during pauses in the game: “Chris! Hands!” and “Rebecca, you have nobody – back up.” Assistant coach Tasha Butts yelled at the entire team at one point to stop fouling, which is a situation Caldwell brought up after the game, saying she “wasn’t pleased” with the fouls by her team. Somewhere in the 13 minute mark of the second half, Doreena Campbell sparked the amazing Bruin offensive run with two consecutive steals for a score. From then on it was a scoring blizzard from herself, Tierra Henderson, Nina Earl and Erica Tukiainen. Some of the offensive sets were ridiculous. My favorite was the bowling-type assist from Campbell to Allison Taka for the score. There were quite a few other three-pass plays, as well. Tasty! Ugly spots for the Bruins, besides the fouling, were the free throws. Sixty-two percent (including 50 percent in the first half) is not where you want to be. They also need to work on shooting consistency. My seatmate and I ended up sitting near one of the UCLA recruiting staffers, who was really cool. He said the reason he decided to check out the game today was because he always sees Nzekwe coming in to shoot early, and leave late. Now that’s my girl! Reppin Seattle to the fullest. Do you think UCLA will be a great threat to stanford this season? I don’t think they’ll be that good quite yet. But my seatmate and I were talking about how fun it would be to see someone sneak in there and take the Pac-10’s third spot, because it’s pretty wide open right now. ASU is on the decline, USC is injured, and nothing is certain except that there are six other teams with a bunch of new hungry freshmen and a few equally new, equally famished coaches. The way the Bruins responded to Caldwell’s halftime mandate yesterday was a very, very good sign. I believe Nikki will take the program somewhere – finally.